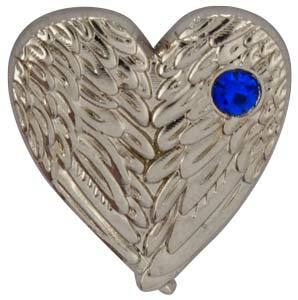 Silver folded angel wings heart pin with Australian Crystal. 3/4 x 11/16 inches. Many Uses angel wings lapel pins, Volunteers, friendship, memorials. We all believe in Angels. "May the Angel wings like those of a dove bring you hope and faith and a lifetime of hope." Quantity pricing. Packaged individually in a clear plastic bag.